Trying to find a useful gift for that special someone that spends time on the trail? Fill their belly up and put a smile on their face! Outdoor Herbivore’s dried meals are the perfect option for backpacking, cycle touring, paddling, camping, and travel. With a shelf life of one to two years, these meals are ideal for storing until the next adventure trip. Backpacking meals have been chosen to fit inside these gift packages. You can find these selected products available on our gift page. Both options include free shipping. Our Gift bag is a reusable dry bag, tied off with a carabiner. The mesh bag is made of 55% recycled polyester and can be used for air-drying wet gear on the trail, or for purchasing and storing fresh produce at home. 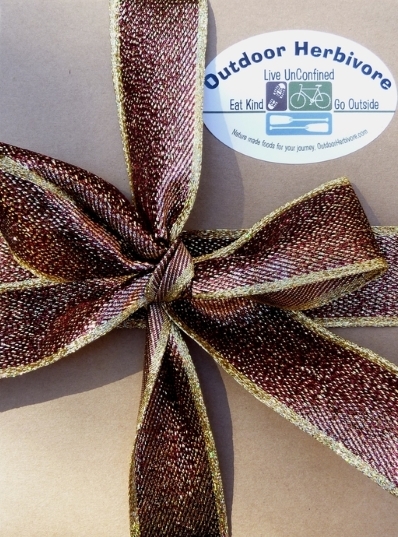 Our Gift box is packaged in a Brown Kraft Box and tied with a colorful ribbon. It is the perfect option for the holidays. The box is 100% recyclable. WHEN WILL I RECEIVE THE GIFT? If you need to receive your gift before Christmas, please order by Monday, December 17th (USA) and December 9th (International).